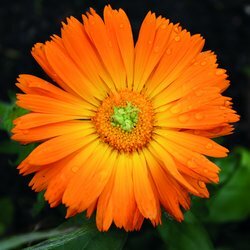 Part of the Marigold and Daisy family this quick growing Marigold Pot produces beautiful large daisy like flowers in different orange colours for most of the summer months. Long oval slightly shimmery hairy leaves. The flowers are often used to add colour to salads or added to dishes as a garnish. They do self-seed very easily so best to collect the heads before they drop. The flowers can be made into a tea which can relieve gastric problems and is also used as an anti-inflammatory. You will also find Marigold Pot in lots of skin creams. Roughly 6 weeks after planting. Dead head before they go to seed to promote new flowers.